With the publication of the America’s Cup Edition of the ISAF Rules of Sailing (interesting wording) we have our first glimpse into the thinking that goes with electronic umpiring. 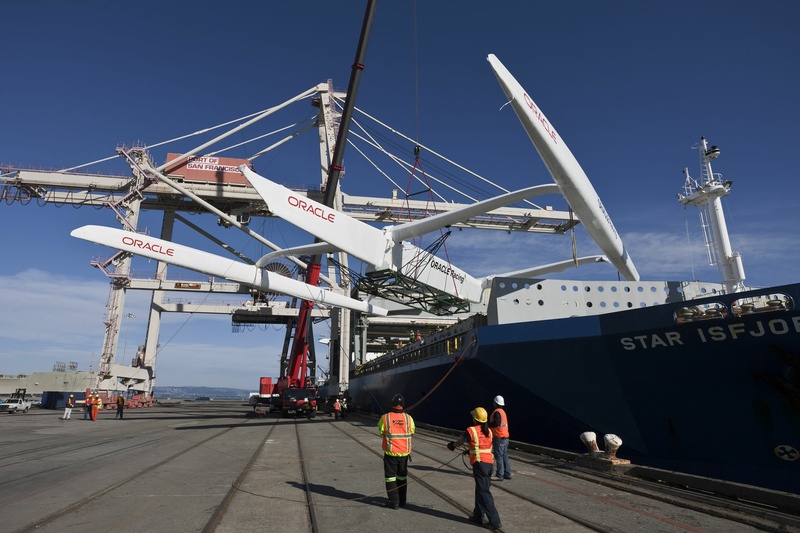 Oh, and, yes, USA 17 and the largest wing ever built are safely delivered to Pier 80, at the foot of Cezar Chavez Street, Port of San Francisco. Much of what is there is a re-saying in different language of the racing rules we already know, but it’s been said since the get-go that the ISAF standard rules would be adapted for this event. Remember February, 2010, and the downwind entry for the port-end boat? The notion being that, by allowing the port-entry boat to come into the box from a point significantly downwind you could mitigate the starboard-entry boat’s advantage? Remember how it didn’t work? Not that I minded the outcome. In the new rules (which should be read as a draft, to be adjusted as a fleet is launched, races are sailed, and intelligence accrues) item 26.1 addresses the problem by giving the port-entry boat a 15-second advantageprovided it’s johnnie-on-the-spot. Port-tack may enter at the 3-minute Preparatory signal. Starboard-tack is not allowed into the box until the countdown reaches -2:45. Around the course, relative position and right-of-way will be monitored shoreside by umpires observing via technology still being developed by Stan Honey, Ken Milnes and their former colleagues at Sportvision. No more chasing the raceboats and waving colored flags. Communications between sailors and umpires are electronic, and forget about penalty turns. If you’re in sub-freezing New England you might not want to watch this . 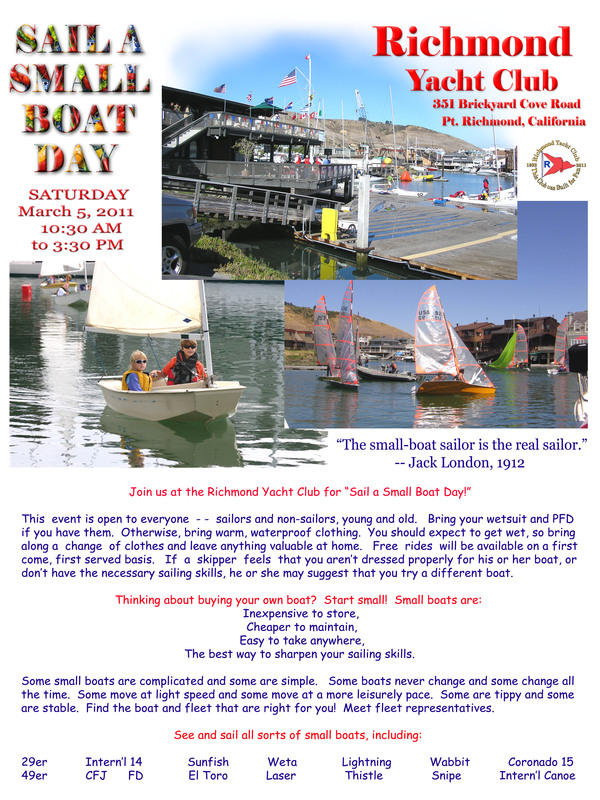 . .
Saturday’s weather outlook is middling but not bad for the Sail a Small Boat Day at Richmond Yacht Club, on the eastern reach of San Francisco Bay. The premise is simple. People who love their small sailing boats bring them to RYC, and between the hours of 10:30 and 3:30 they make them available to people who want the experience of sailing them. It’s a great way to sample a new boat, or a new type of boat. The people who put this thing on are hoping you’ll get hooked of course, and what’s wrong with that? Notice the suggested apparel . . .
New York, NY, March 3, 2011 — The organizers of the Transatlantic Race 2011, the Royal Yacht Squadron, New York Yacht Club, Royal Ocean Racing Club and Storm Trysail Club, have extended the deadline to enter the Race to March 31, 2011. With the transatlantic fleet now over 30 entries and many new inquiries following the success of the RORC Caribbean 600 – part of the companion Atlantic Ocean Racing Series – the organizers encourage those interested to enter the TR 2011 as soon as possible to secure a spot since the Notice of Race notes a maximum of 50 yachts for the Race. The TR 2011 will cover 2,975 miles from Newport, R.I., to the Lizard in England. The focus of pre-race activities will be the New York Yacht Club’s Harbour Court clubhouse in Newport, R.I. There will be three staggered starts from June 26 to July 3. The awards ceremony on August 9th and other post-race activities will be held at the Castle, the home of the Royal Yacht Squadron in Cowes, England. The fleet will include IRC Racing, IRC Racer/Cruiser, Classic and Open divisions with a minimum length overall (LOA) of 40 feet and no maximum. Competition is building within several segments of the diverse fleet, notably the 100’ and up range which includes Sojana, Rambler 100, ICAP Leopard, and Maltese Falcon. Tight racing is also expected in other classes and divisions, such as yachts in the under 50’ range in IRC Racing and IRC Racer/Cruiser including the Class 40s – Concise 2, Dragon, and Kamoa’e, the Rogers 46s – Shakti and Varuna, as well as British Soldier ASA, Jacqueline IV, Sasha, Dawn Star, and Carina. For a complete list of entries click here. All race documents are available at transatlanticrace.org. The TR 2011 is the centerpiece of the Atlantic Ocean Racing Series (AORS), and is organized in concert with the following clubs: Royal Malta Yacht Club, Annapolis Yacht Club, Ida Lewis Yacht Club, Montego Bay Yacht Club, Naval Academy Sailing Squadron, Jamaica Yachting Association, Antigua Yacht Club and Real Club Nautico de Sanxenxo. Two races in the AORS have been completed: the Pineapple Cup – Montego Bay Race and the RORC Caribbean 600. The Pineapple Cup, from Ft. Lauderdale, Fla. to Montego Bay, Jamaica, a distance of 811 miles, was won by Genuine Risk, a 97-foot canting keel super maxi skippered by Hugo Stenbeck. In the RORC Caribbean 600, George David’s Rambler 100, took line and overall IRC honors and set the monohull record of one day, 16 hours, 20 minutes and 2 seconds for the course’s 600 miles. In addition to the TR 2011, upcoming races in the AORS are the Annapolis to Newport Race (June 3); Rolex Fastnet Race (August 14); Biscay Race (September 11-12) and Rolex Middle Sea Race (October 22). Interest in competing for the Series has been increasing rapidly with nearly half of the TR 2011 entries planning to compete for the AORS. Of the seven races in the Atlantic Ocean Racing Series, three races including the Transatlantic Race 2011 must be completed to qualify. 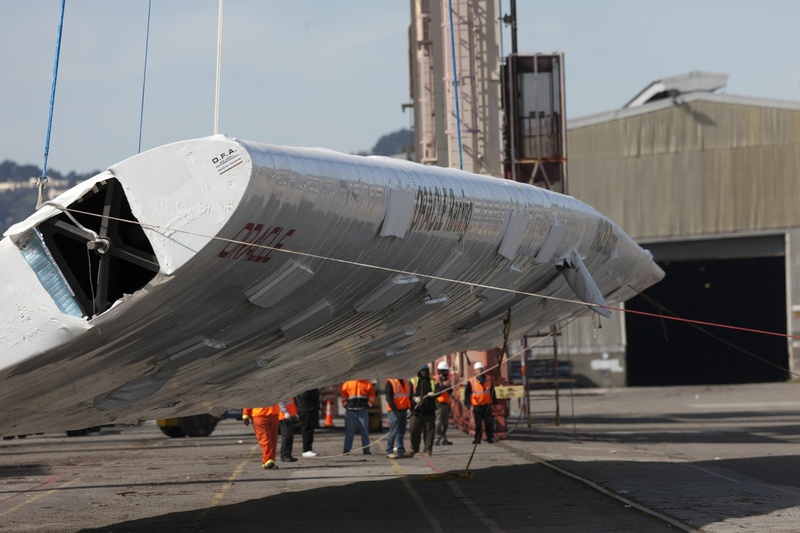 Races will be weighted equally with the exception of the Transatlantic Race 2011, which will be weighted 1.5 times. Cox-Sprague points will be awarded within individual races in the series to accommodate differences in fleet sizes. 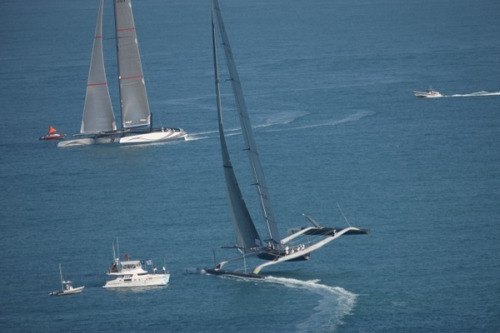 A yacht will be scored in the series using its two best finishes in addition to the Transatlantic Race 2011. Awards for the AORS will be presented in November, 2011 at the New York Yacht Club’s Annual Awards Dinner in New York.